You make one mistake and a millisecond later the red lights and sirens go off and there is absolutely nowhere to go. This is the way it is for Marlies goalie James Reimer, a shining light of late for the Toronto Maple Leafs. This is the way it is for his Dad, Harold, who operates the family business in Morweena, Manitoba. James Reimer established himself as a prospect on the rise in 2008-2009 after the Marlies sent him down to Reading. It could have been a one-way trip. Instead Reimer competed relentlessly. 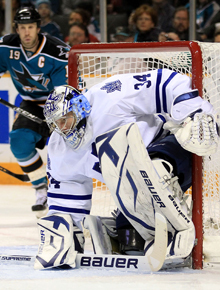 When the Leafs loaned him to the South Carolina Stingrays, Reimer won playoff MVP honors. Last season brought 14 wins in 24 Marlie games. This year he was rewarded with a callup to the Maple Leafs when Jean-Sebastien Giguere was injured. He has won four straight and compiled a tidy 1.92 goals against average with a 9.47 save percentage. While the sampling is incredibly small (Philadelphia's rookie netminder Sergei Bobrovsky has played 27 games to Reimer's six), Reimer's save percentage is fifth in the league. His goals against sits 10th and the notion of sending back to the Marlies may be put on hold, especially with Jonas Gustavsson struggling to claim the number one spot. Reimer was a goalie by necessity. His older brother Mark needed someone to shoot on. James played hockey on the floor, the ice, even in the back corner of the family's gargantuan shop. After some boys couldn't score on him on an outdoor rink they went back and told their father. He was a rep coach who needed a goalie. Up to then, Harold and Marlene hadn't been convinced that minor hockey was something they wanted for their son. "My parents wanted to make sure they were putting me into a place with the right atmosphere and values," he said. Five years later, he was playing with Red Deer in the Western League. James Reimer is just about the nicest 22-year-old on the planet. His countenance did not much change when he surrendered only three goals in 11 rounds of shootouts during an exhibition game against Philadelphia, or when he was lit up for five goals and another in the shootout by Oilers' prospect Linus Omark in the AHL. "Every time we talk my brother and my father reminds me of those five goals," Reimer grinned. "That's great. They help me keep things on an even keel." Which brings us back to Harold Reimer and his business. He is a house mover, the guy who loads homes onto a truck and delivers them hundreds of kilometres, even provinces away. "Our jobs have one thing in common," James Reimer said. "Screw up and everyone knows about it."